Successful lawn seeding depends on soil preparation. Soil that's ground with heavy thatch or dead vegetation requires more work to get ready than relatively clear soil. Soil may be loose and easy-to-work, or compacted and in need of aeration before you can successfully seed. Spending the time to prepare the soil properly ensures that your newly-seeded lawn has the best chance for success. While the proper tools are available for purchase, it is much easier on the wallet to rent them from a hardware or home-improvement store for a modest fee. Take a soil sample to your local extension office to check the pH, or purchase a pH testing kit from a garden center. Purchase any recommended soil amendments such as lime, as grass prefers slightly acidic soil. Remove all weeds, vegetation and debris from the soil. Pull weeds up by the roots so they do not regrow. Use a sod cutter to remove areas of heavy thatch or old sod that is at least 1 inch thick. Otherwise, use a power rake to till the thatch under the soil's surface. Till the soil to a depth of 4 to 6 inches. 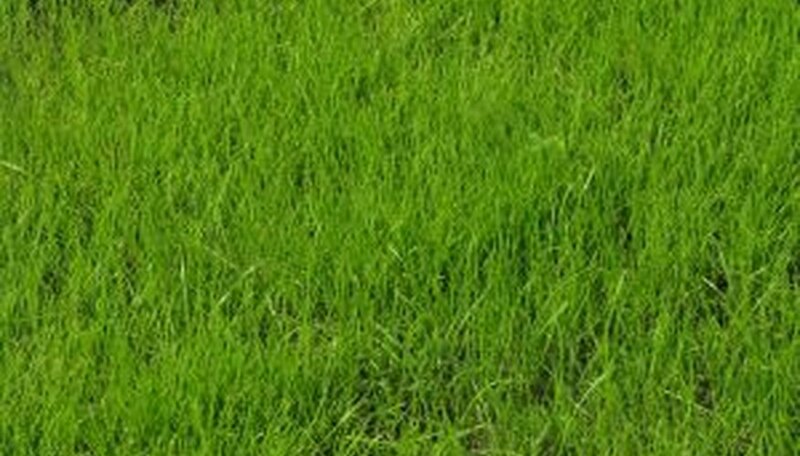 Grass seed requires loose soil in order to send out a deep, healthy root system. Till in the soil amendments as recommended by your pH testing. Level the entire seeding area, paying special attention to areas that normally collect water. Use soil from other areas of the lawn or bring in sterilized soil to fill in low areas. Water the newly-leveled planting area thoroughly, then allow the soil to settle for five to seven days. Level a second time with a power rake, filling in any areas that settled unevenly with fresh soil. Apply a starter fertilizer before laying the seed. Choose a fertilizer formulated for your climate and the variety of grass seed you are planting. On loose soils with minimal vegetation, aerate instead of raking and tilling. Use a lawn roller after seeding to ensure the grass seeds all come in contact with the soil. Avoid tilling thatch under if a lot of weed seeds are present; instead, remove and dispose of it. Do not use any chemical weed or pest killers on the area before seeding, as this may prevent the grass seed from germinating.